Abby is a Percheron/QH/Morgan cross. Her story begins with the Amish. As a two year old she worked the fields in a team and was bred. 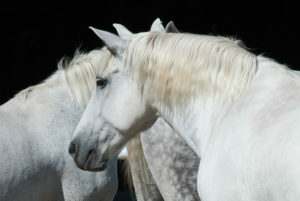 A woman bought her at auction but did not know she would have a foal the following spring. The foal and the mare became too much for her to handle and she gave them to a young girl in the neighborhood who raised the foal and sold it. 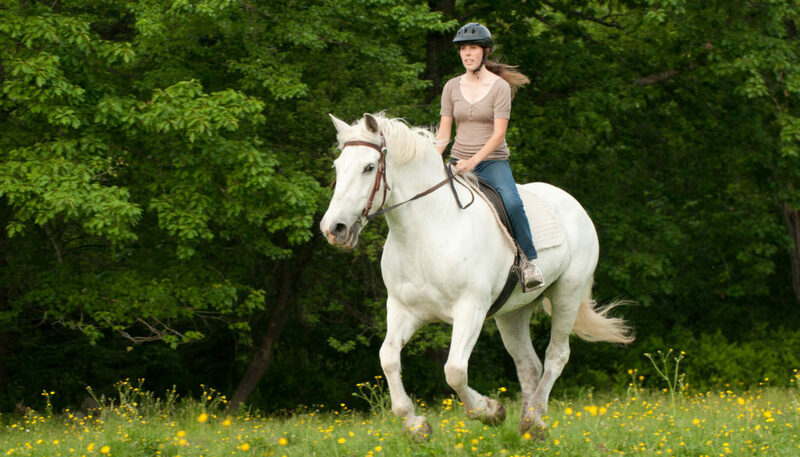 The girl loved Abby and taught her dressage and jumping, showed her in her area throughout her teens and even continued driving her in a forecart for fun. As she reached the age of college and family she felt she had to give Abby up. I found her in a craigslist ad in New Hampshire. She had a severe case of scratches but was otherwise healthy and seemed quiet and laid back. We discovered that Abby was indeed well-trained and felt that she would not make a good beginner horse because she was too sensitive to leg. She served a valuable place here at the farm as a guide horse and a teammate to Big John in harness. 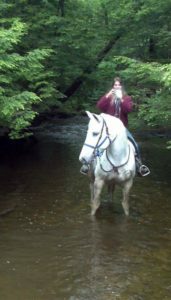 After a year or so she became much more attuned to being in her herd and following the trails and she is now one of our most reliable beginner horses! She is 17.1 hands so she’s a bit large for the kids. She has a great personality one-on-one but she’s a bit crabby toward strangers. Under saddle, Abby is phenomenal. 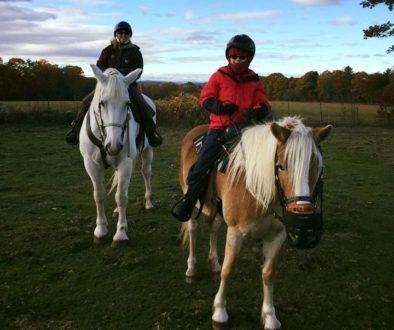 Abby has participated in specialty shows at local summer camps and is part of all of our rides, both at home and away. She is great at the beach, weddings and on the street in Freeport at Christmas time. 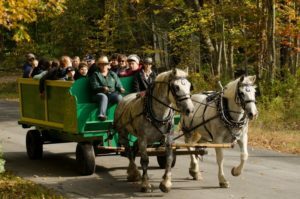 She is the guides’ favorite and their choice for all rides that are away from the farm or long. 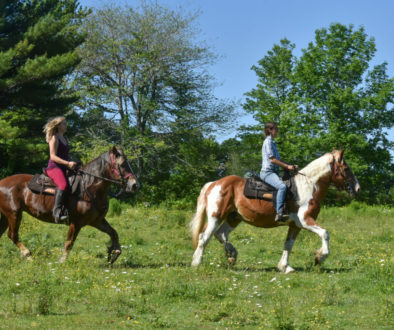 Her gaits are comfortable, she’s willing and fun for advanced riders as well. Molly Stansfield took lessons on Abby to get ready for her college application at Alfred University.